A catalogue of the artistic life and projects of an artist, writer, and mother. I have a goal of creating and posting something each day. We found ourselves in quite the pickle this weekend. As I mentioned, our dishwasher died when I had a big party planned for Sunday afternoon. Well, Sunday morning the disposal started leaking, as did the tube for the sprayer and the pipes. By around noon Sunday the cupboard under the sink had flooded three times. My poor husband spent the entire morning lying under the sink, working on it. Before the guests arrived he had replaced the disposal, the sprayer and hose, and tightened all the plumbing. The dishwasher situation hasn't been resolved. Even though it means hand washing, I think I'd rather wait until we can afford a complete appliance package than just replace the dishwasher. We had this situation at our old house. The dish washer died and we replaced that. Then the oven hood broke, so we replaced that. Then the microwave died, and then the stove went. Then we got new counter tops... we ended up with a too-small kitchen where nothing matched. One of the reasons we were building a new house was that I was sick of our cramped house where everything felt patched together. Since we never got to live in our dream house and ended up in another old, too-small house I at least want matching appliances. They're all the same age, so I know if one goes the others won't be far behind. I know I sound really whiny. My husband is always complaining about how spoiled I am. And really, I can't think of a single European house I've ever seen that had a dish washer. Usually there's a tiny clothes washer in the kitchen and that's it. In Italy I had to wash clothes by hand with a bucket and wash board and hang them out to dry. The land lady, Signora Bongini, had a rare clothes dryer and she would allow all the tenants to use it for towels and jeans and heavy things. So, I'm sure we can live without a dish washer for a while, but I'm not happy about it. Trying to host a party and scare up guests and working in a defunct kitchen made me really miss my friends from home and my hypothetical new house. The weather, dismal and dark and rainy all day, isn't helping. Besides that, despite my new stepped-up exercise regimen, I've been gaining weight like crazy and my face is all broken out and my stomach has been really upset. I don't know what my problem is, but I'm a mess. I decided to add some lacto-fermented food to my diet. Lacto-fermentation is a form of canning that doesn't require cooking or the use of vinegar. The result is raw food cured with live cultures, like those in yogurt. These are really good for you and provide a hefty dose of probiotics and nutrients. Back when we had our big garden I made some sauerkraut from our homegrown cabbages using this method and it was delicious. I decided to make some dill pickles this year. I had just enough dill from our yard but had to buy the cucumbers from the farmer's market since ours did nothing, a bitter pill and another reason I'm frustrated with this house. I am using a recipe from Sally Fallon's Nourishing Traditions cook book, which I highly recommend. 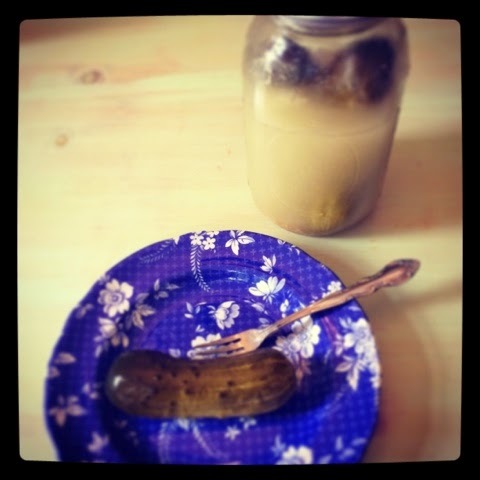 The resulting pickles are fantastic and much crunchier than any store bought kind, a result of them not having been cooked. I bought them from the farmer's market and pickled them within an hour. My family prefers more dill than is called for in the recipe. I ran out of whole mustard seed and used ground mustard, which is why the brine looks cloudy. If you're giving these as gifts you will want to make sure to use whole mustard for a prettier brine, but otherwise using the ground seed doesn't affect the result or taste. I get whey from making homemade yogurt, but you can strain the whey out of store bought plain yogurt by lining a colander with a cheese cloth, placing the colander over a bowl, and filling the colander with yogurt. You will have whey in the bowl in a few hours. Wash the cucumbers well and set aside. Wash the canning jar and lid in very hot water. You can boil and cool the jar if preferred before use to sterilize it. Place the cucumbers in the jar. A wide mouth jar will work best if you have one. Combine remaining ingredients and pour over the cucumbers, adding more water if necessary to cover the cucumbers. The top of the liquid should be one inch below the top of the jar. Cover tightly and leave at room temperature for 3 days before transferring to cold storage in a root cellar, basement, or refrigerator. And there it is. SO easy! And so much healthier! I have some store bought cucumbers I'm about to ferment in the same way. I'm not normally a huge pickle connoisseur, but my boys and their father always beg for those huge Kosher dill pickles at the fair. I like these pickles well enough to beg for them at a fair! I hope they'll help get me back on track. I've been pretty unmotivated in general all day today. I'm still not finished washing the party dishes from yesterday. I have an enormous pile of Wendy-Kins dolls up in my office awaiting re-stringing, so I hope to talk myself into going up there and working at some point. Look for those in my store coming soon: http://stores.ebay.com/atelier-mandaline. Things have been running less than smoothly around here, I'm afraid to say. I agreed to host a party tomorrow for my sister, who is selling Jamberry nail wraps, so I've been trying to cajole, bribe, beg, and otherwise entice some people to attend. I actually have high hopes for the nail wraps. They're supposed to last for two weeks. The removal is easier too; you just soak them in water and peel them off so the process doesn't ruin your natural nails like acrylic and gel polishes. Before children and when I worked as a graphic designer in an office I had gorgeous nails. I would spend every Saturday morning manicuring them for the week ahead. I'm hopeful the Jamberry wraps will stand up to doll repair so I can have pretty hands again. You can order Jamberry wraps from my sister's Facebook page: https://www.facebook.com/natslovelynails. Specify you're ordering from Amanda's party if you want my party to get the credit. Lissy is the only doll I've restored this week. Naturally, since I'm planning a rare event, the dishwasher decided to die, and now the kitchen sink is also leaking into the cabinet below. I used to have a Bosch dishwasher and I absolutely loved it. You couldn't even tell it was running. However, I have a long-term plan for the kitchen that includes an induction cook top and oven from Ikea. That doesn't come in white. The Bosch dishwasher I want is only available locally in white and has to be special ordered in the stainless steel to match the Ikea oven, so the Bosch wouldn't arrive for a couple weeks. Luckily my daughter loves to hand wash dishes! I replaced the elastic in Lissy's underclothes. Even though I have the whole house to clean and lots of cooking to do, I spent the week attending meetings and breakfasts every morning but one. Then last night I tried to write my eBay store newsletter, but the Web site wasn't working and I ended up messing with it fruitlessly until 1 AM. So if you're anticipating the store news, I'm sorry. I'll get it out as soon as I can. Lissy's costume is complete and original. 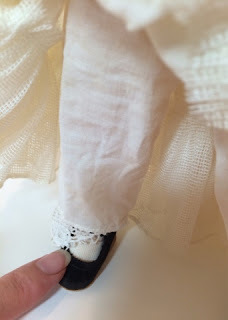 I repaired the lace on the pantaloons. Not that there's too much store news to report. 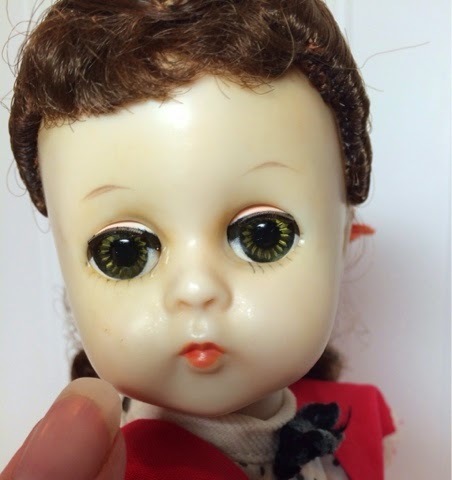 The rare Baby Button Nose I told you about sold before I ever got her listed and is already in the possession of her new owner. I spent several days trying to identify another Effanbee baby and finally figured out she's Sugar Plum. I'll write more on her when I get her finished. She's waiting for a new Mama cryer box to arrive. I cleaned my office, a massive undertaking of a couple days, listed some Barbie, Kelly, Krissy and other fashion dolls clothing and accessories lots, and finished one doll: Madame Alexander's Jo from Little Women. This costume variation is rarer. 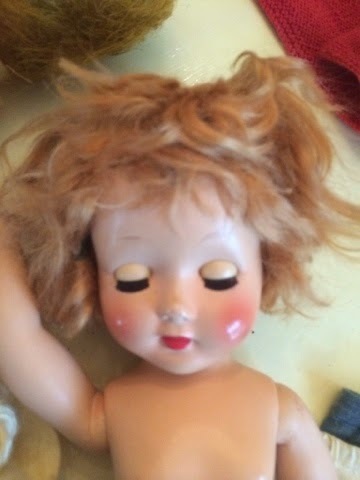 A few weeks ago I got a lot of dolls which included this doll. 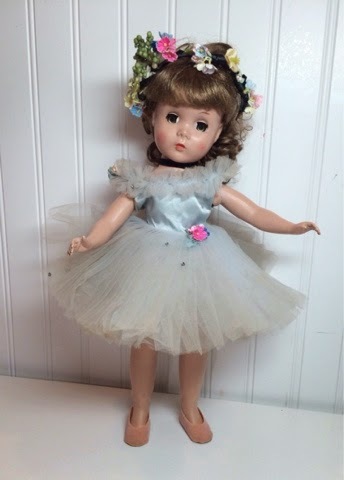 This Lissy is the straight arm and leg version from the late 1950s to around 1960. Right after this they discontinued Lissy and replaced her with the 12 inch Nancy Drew dolls. Lissy wears a less-common variation of the Jo costume and it's totally complete. 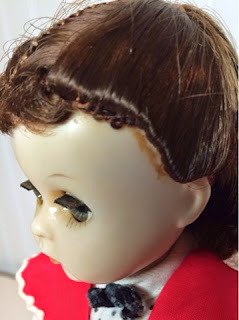 Her hair is still in its original set with the hair pins in place. 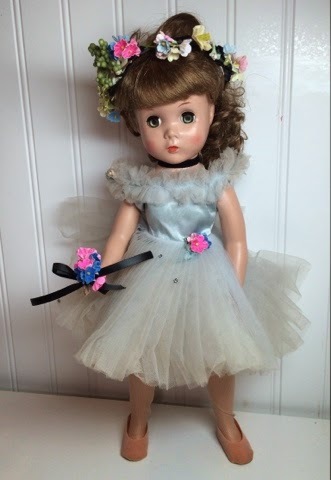 Lissy has her original hair pins and ribbon. Lissy's problem was that she was grimy and stank of cigarette smoke. Her face was yellowed from the smoke as well. The original owner had cinched her petticoat and pantaloons around her waist with a rubber band and it had rotted into her waist. I cleaned her with a Mr. Clean Eraser and then with white vinegar and set her in the sun to bleach the darkening. I scraped the rubber band off her waist. Her eyes were sticking so I cleaned them with a toothbrush and window cleaner. They're working well now. I scraped glue residue off her face around the edges of her wig, and then I cleaned her all over with special doll cleaner. Lissy turned out really well. The darkening came totally off her face, leaving her with a clear peaches and cream complexion. Her big green sleep eyes work perfectly. I dabbed her hair clean with fabric softener and water so I wouldn't mess up the set. When it was dry I sprayed it with Febreze to eradicate any lingering smoke odor. I can't smell it at all now, and I'm really sensitive to cigarette smoke. When that was dry I sprayed her hair with hair spray to keep the set in place. 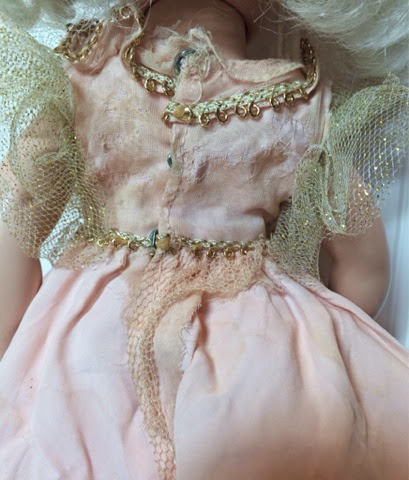 The only flaws I was not able to completely repair are two extremely faint and tiny brown pin marks on Lissy's face and a bit of glue residue around her hair line. I scraped the glue off as much as possible but the old dark glue seems to have stained the plastic in this spot. It's not a really large spot, however. I thought about blushing Lissy's face to help hide these issues, but I decided in the end that they aren't large enough flaws to detract from the value of Lissy having all original paint, hair, and costume. Glue residue stained the face in one spot. I couldn't fully remove two tiny spots. All in all, Lissy turned out well. 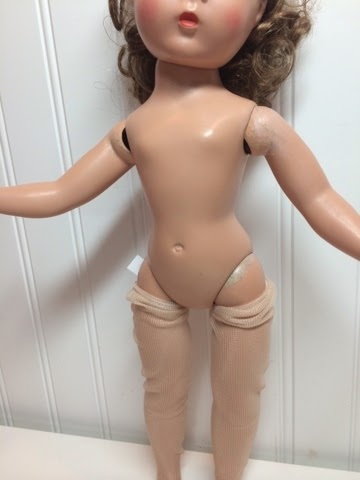 If you search for the Lissy Jo doll online you will see she's not terribly common, and even less so wearing this costume variation. 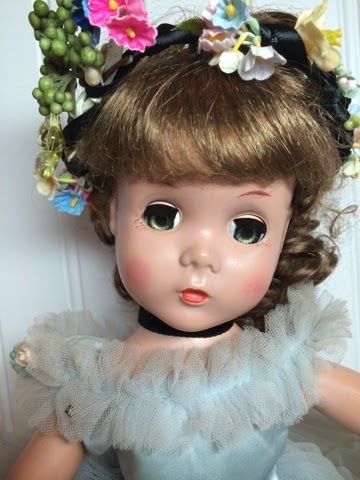 She's a fantastic doll to add to your collection. 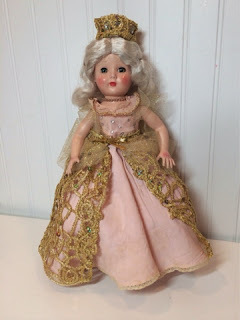 Beatrice Alexander loved Little Women so much she made a set of the dolls either every year or nearly every year, depending on which expert you believe, the company has been in business. I'm planning a custom set of Wendy-Kins as the four girls and Marme, and I guess I'll finish it if things stop breaking around here. 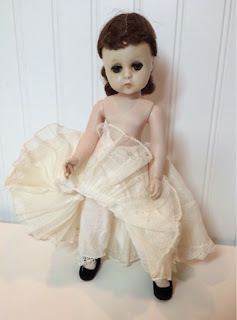 In the meantime you can purchase this doll and many more in my store, so please check: http://stores.ebay.com/atelier-mandaline. My Effanbee baby research turned up an unexpected bonus: a love story! I ordered a large lot of Patricia Smith Modern Collector's Dolls, volumes 1-4, published in the 1970s. The baby in question isn't pictured (in FOUR books!) 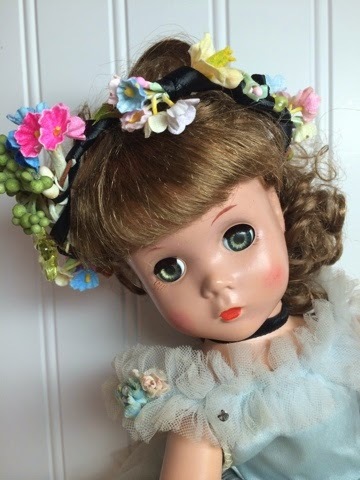 but there is a list of every doll released each year by each company and I was able to figure out who she is. Some of the books contained inscriptions, to Meriel from Fred. 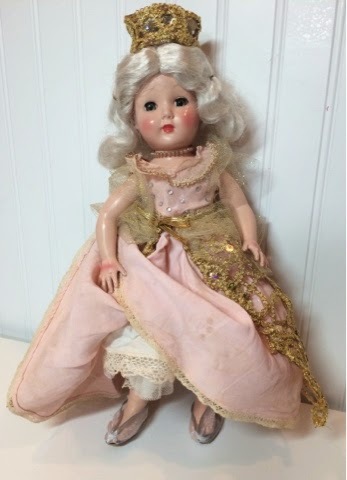 In 1977 Fred gave Meriel a Madame Alexander Collector's Dolls book for Christmas. 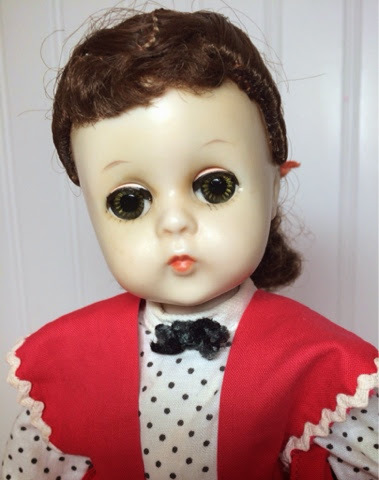 In 1979 he gave Meriel another collector doll book for her birthday. 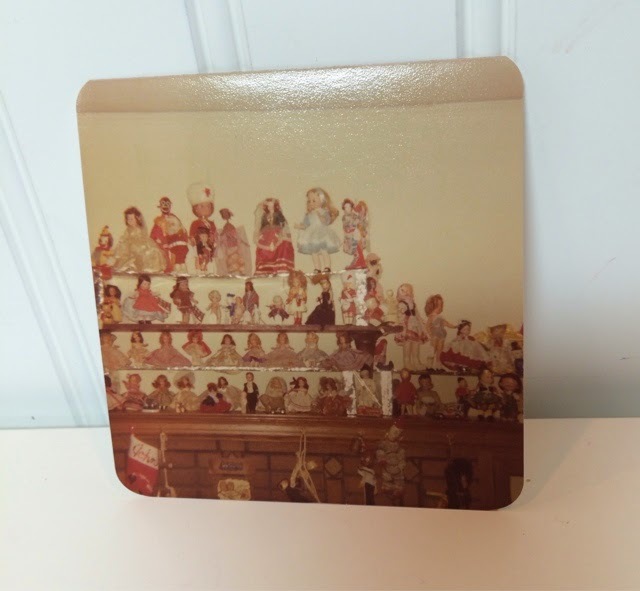 A photo of a doll collection, dated May, 1977, was stuck in one of the volumes. I assume this is Meriel's collection, proudly displayed on the mantle at Christmas time. They had a son named John, it appears from the stocking hanging on the chimney. I noticed the homemade aluminum foil shelves adding extra display space, presumably by Fred. My husband noted Fred should have put some extra supports in as the shelves are sagging. Several places in the books contain notations about "our" dolls, which ones they owned and the worth at the time according to the Kovels. 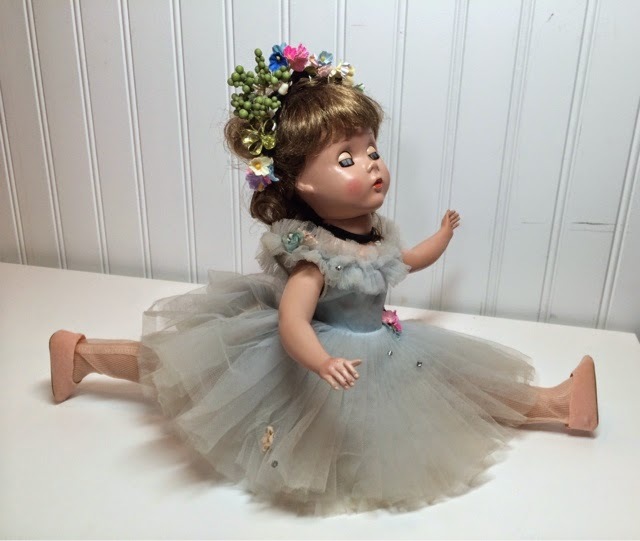 It seems Fred was a good man, willing to display dolls in his living room, avidly seeking new ones for Meriel. It's a sweet story! Innocent voyeurism such as this is so entertaining! 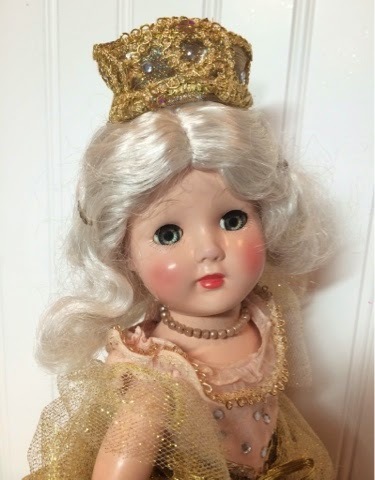 Last week I promised to finish my Honey Cinderella doll and I finally got her done! It wasn't easy; we had a super-busy weekend with marching band and the local Apple Festival. We rewarded ourselves for all the running around with delicious baked apples for dessert tonight. The Apple Festival was great for me. 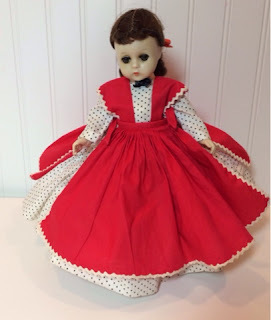 I picked up a super-rare Madame Alexander Mary Ellen doll and a bunch of small doll accessories and clothes at a thrift store. I hoped to have Mary Ellen listed within the week, but my daughter is uncharacteristically taken with her and has been begging to keep her. 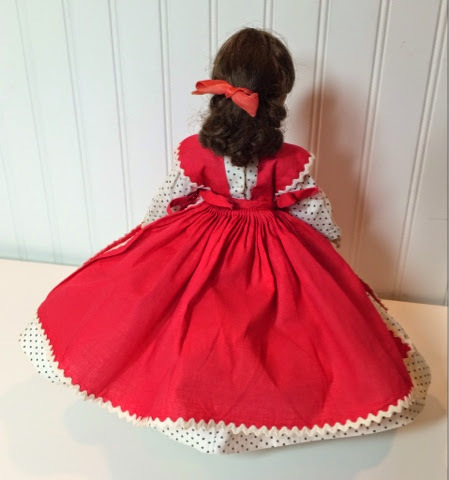 At 31 inches tall, Mary Ellen is one of the largest Alexander dolls ever made. My daughter loves that she can wear real toddler clothing and shoes. So, we will see if Mary Ellen makes it into the store. If not I will at least write a post about her restoration. Honey had her original barrettes but her hair was cut. 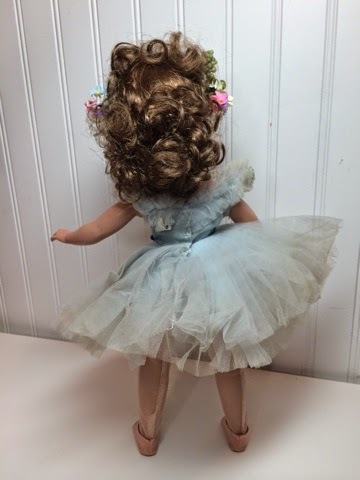 Honey, as you might remember, came wearing her original Cinderella gown and still had her barrettes in her hair. Unfortunately, someone cut her hair along the way and her dress was in pitiful shape. Honey also had a chunk of paint missing from the end of her nose. 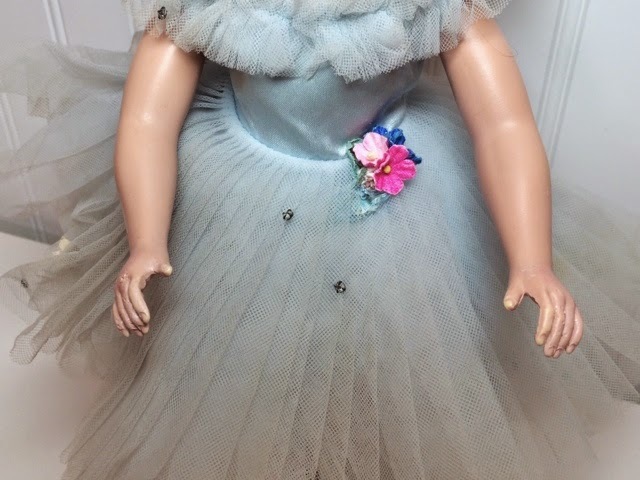 Honey's Cinderella gown was quite fanciful when it was new. The skirt was made of layers and layers of taffeta, tulle, and organdy. 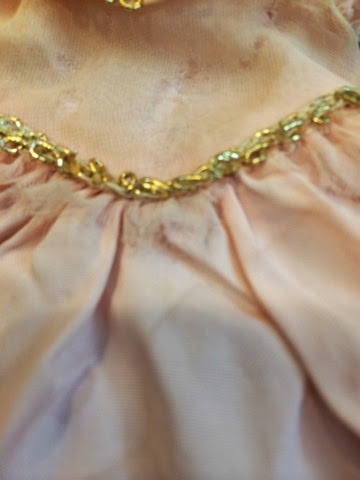 The bodice was lined in organdy trimmed with gold loop braid and the sleeves and neck were ruffles of gold-trimmed organdy. Cinderella would also have worn a crown of gold-trimmed fabric. The tulle and organdy disintegrated and were cut away. Unfortunately, the tulle and organdy disintegrated and someone cut them mostly away. 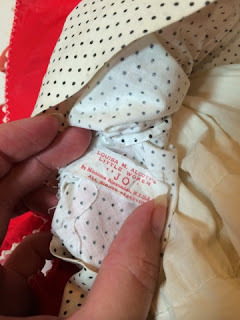 The taffeta has some age yellowing and staining and some pin holes from age. 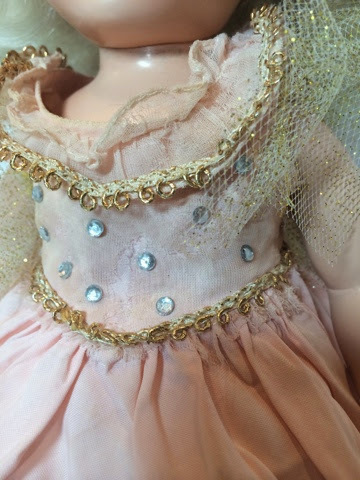 I cleaned the dress with carpet spot cleaner and set it aside while I worked on the doll. There is some paint scraping in the joints. I started by re-stringing Honey with elastic cord. 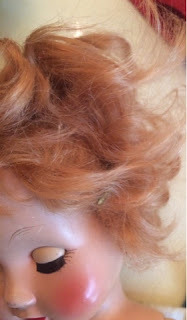 I soaked off the original red mohair wig and Honey decided to go blond. I found a platinum blond synthetic mohair wig a perfect fit. The style is correct. I would have liked to replicate the original, but I knew I'd never find that two tone gold and copper mohair anywhere. Once the wig was in place I put Honey's original gold barrettes back on. 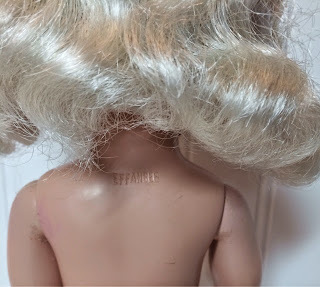 Honey's original barrettes in the new wig. I re-painted the tip of Honey's nose and painted over scraping in her joints. Although I waxed these after painting they are already scraping up again. I left some play wear on Honey's body as it won't show under her clothing and is minor. Honey's face after the nose was painted. I wasn't sure what to do about Honey's dress. 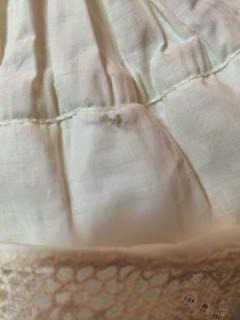 In the end I decided to trim the organdy along the waist, which was already cut, as close to the seam as possible. The tulle in the back of the dress wraps around the closure, so I left that because I didn't want to mess up the opening. I replaced the sleeve ruffles, which were partly cut away, with gold tulle. 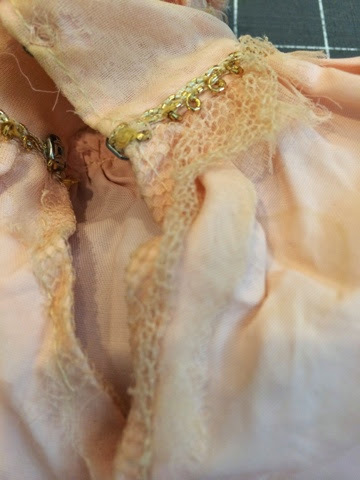 I treated the fraying organdy on the neck ruffle and bodice with Fray Check to stabilize it and prevent further disintegration. Then I glued rhinestones over the front bodice on top of the organdy to draw attention away from the frayed edges. 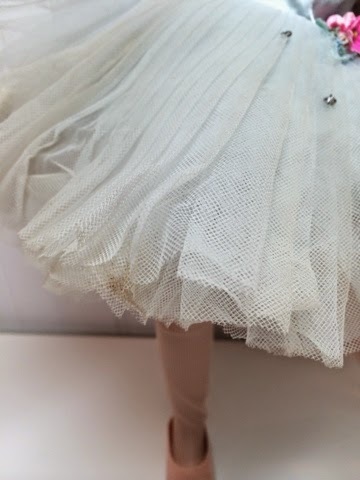 To cover the skirt and give the dress its original fairytale feel I made a new over-skirt from metallic, sequin-trimmed lace. I hand-sewed panniers of metallic tulle around the waist. The skirt closes with a hook and eye so you can remove it. I made a matching crown and gave Honey a vintage choker of pink glass pearls. The over-skirt covers the cut-away material on the back opening the dress and allows the dress to really stand out like a ball gown. 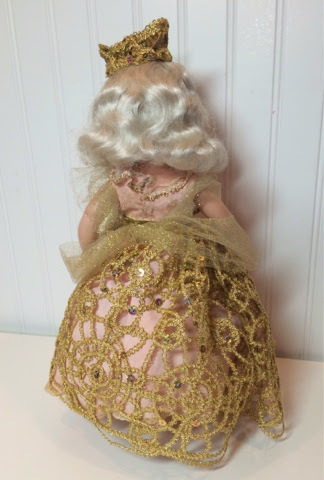 I thought a little extra volume under the skirt would make Honey look extra-special, so I gave her vintage Madame Alexander crinoline and pantaloons with crocheted lace trim from the 1960s. The crinoline has a tiny hole from age, which I treated with Fray-Check to keep it from expanding. Honey just had to try the Marilyn pose since she has her new blond hair! 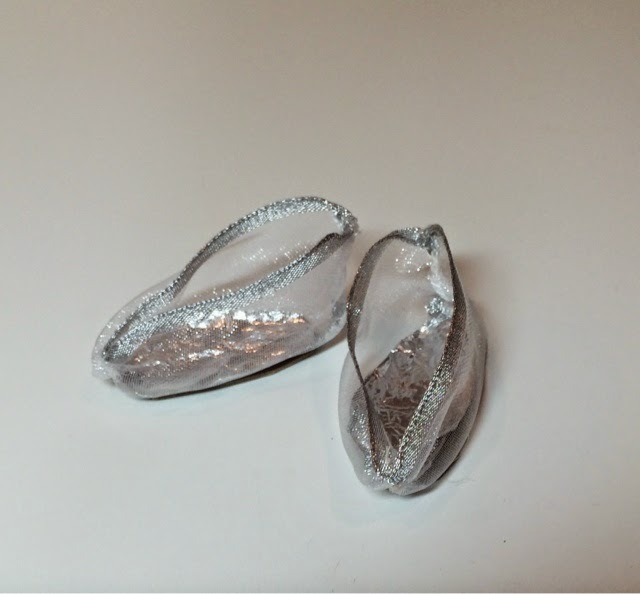 Finally, I made Honey some "glass" slippers from transparent wired ribbon, cardboard, and foil. These are cute. They are a little loose but will stay on for display and posing. The edges are wired so you can cinch them over the top of Honey's feet to help them stay put. Cinderella shows off her glass slippers. I think Honey/Cinderella turned out very well. 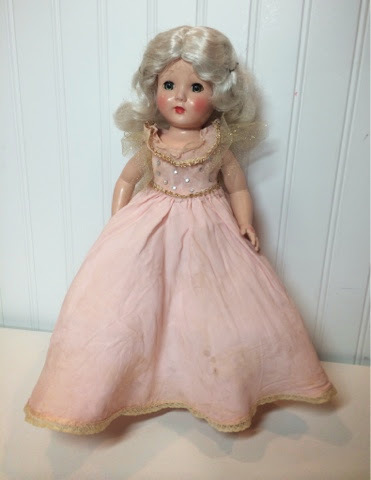 She's a beautifully-sculpted doll and her dress is really fancy. All in all, Honey displays as a restored early 1950s doll. She is very lovely but she doesn't look brand-new. This isn't a very readily-available doll under normal circumstances, and this one is totally unique! You can find her for sale, along with many lovely dolls, in my store, so please make sure to check: http://stores.ebay.com/atelier-mandaline. 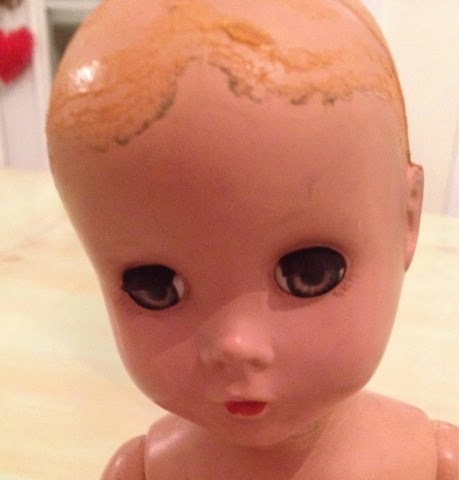 A few months ago I purchased a Madame Alexander Maggie-face doll in need of total restoration. 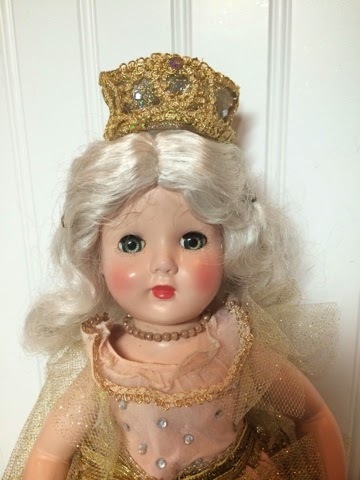 I bought her from another doll restorer who had gotten behind on her projects and felt like she couldn't finish this one. I know the feeling well! 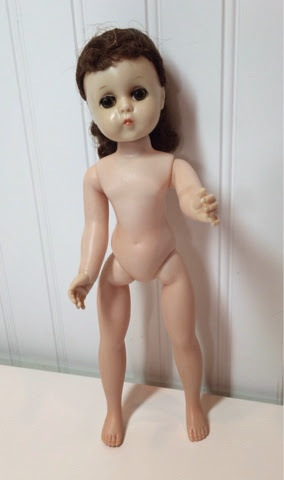 I have a few dolls for sale right now who are restored but not dressed and dolls parts in need of restoration because I got too ambitious in my purchasing. My workshop/office, at less than 200 square feet with a dramatically sloped ceiling, doesn't allow for much storage of unfinished works! You can help me thin out the herd in my tiny room by purchasing some inventory from my store: http://stores.ebay.com/atelier-mandaline. 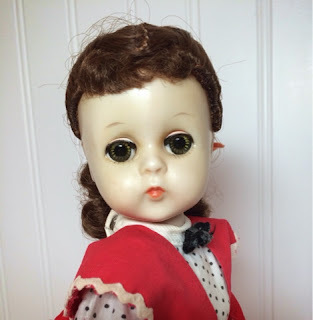 I really enjoy restoring dolls in the raw state of this Maggie. Since she didn't even have a wig there is no clue as to which character she might have originally portrayed. Maggie didn't need much difficult restoration. I re-strung her. Her face paint was very faded so I just traced over her eyebrows, lashes, and lips and added some blush. She had a tiny bit of original eyeshadow left and I enhanced it. Thank goodness she didn't need a lash replacement! I've done entirely too many of those fiddly jobs lately. 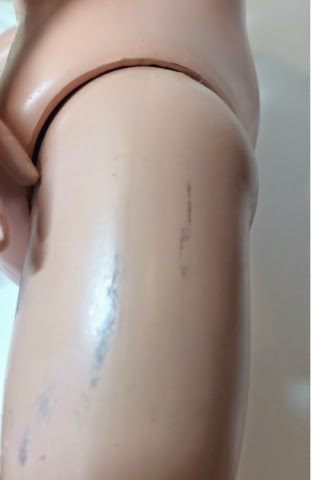 Her joints have scraping, which I mostly left alone, as they will just scrape up again. I did paint over the scrapes under her chin and on her hips and shoulders where they might show in brief clothing. The main issue was that Maggie's fingers were chewed up a bit. I considered whether to try to fill in the chew marks with epoxy. This would involve sanding the fingers back into shape and repainting them. In the long run I decided that would be as obvious as just leaving the chew marks, which are like tiny pin holes, and painting over them. So I just painted her hands and gave her a bouquet to hold after her performance. This hides the marks well. I left some joint scraping unrestored. I painted over chew marks in her fingers. 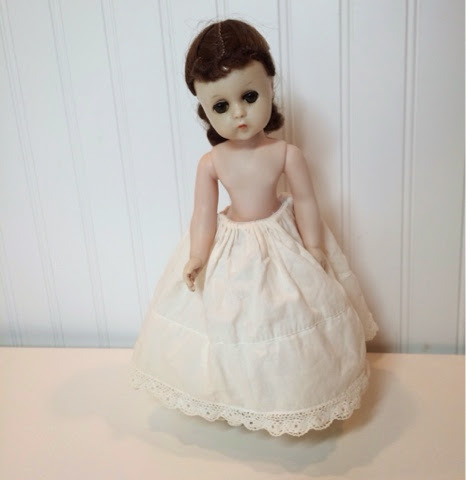 Maggie was a blank slate waiting for me to endow her with an identity. I played around with various wigs and costumes until I found the best fit. 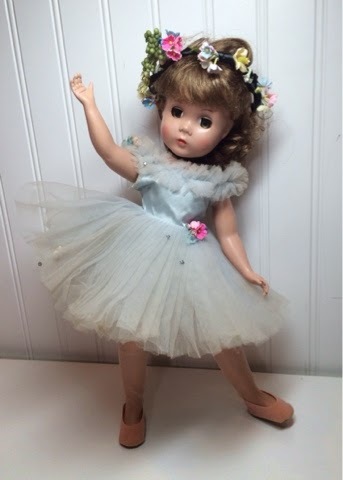 I decided on a blue ballerina dress originally made for the 17 inch Elise doll. 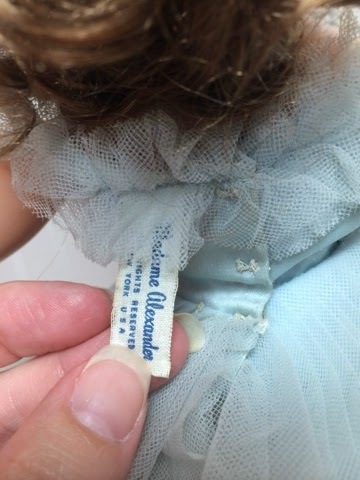 As well as I can tell from my Patricia Smith Alexander Dolls book (the photos leave a lot to be desired) this is the ballet costume produced from 1967-1970. 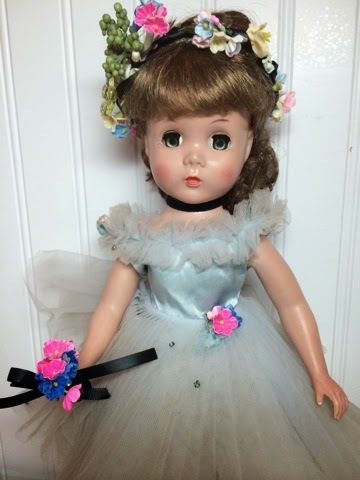 It's only slightly loose on Maggie's shoulders and is festooned with flowers and rhinestones. I sewed and glued vintage unused flowers over some that had fallen off at the waist and used the same flowers to create a new headpiece and bouquet. 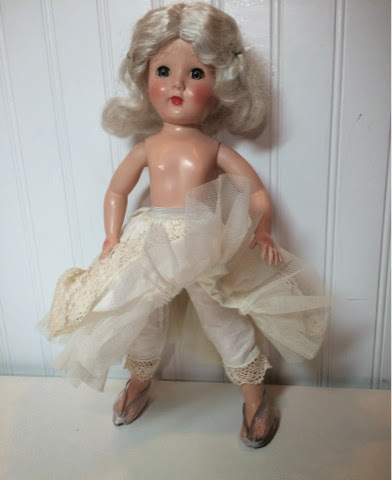 Maggie also wears new sheer thigh high hose and Alexander pink flocked ballet flats from the Mary Ann face dolls of the 1960s-1980s. These are both slightly large on her but will stay on well enough for display and posing. The dress has a few spots and age discolorations here and there and the shoes have some yellowing, but nothing major. Since I chose a fancy dress for Maggie I decided her hair should be something special. I was torn between a platinum blond mohair wig and this long brown wig with straight bangs and curls in back. 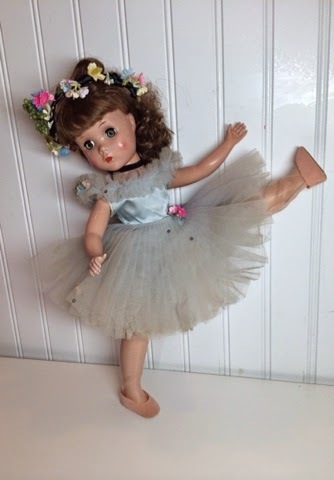 I decided on the brown wig, partly because I already have a Maggie I wigged with a platinum mohair wig and partly because I thought I could style it to look like the Maggie ballerina's which Madame Alexander produced in a red costume. I had trouble gluing the wig on low enough to cover the old glue marks. When I had the wig low enough to totally cover them Maggie's eye wouldn't open because her bangs were in the way! So I pushed the wig back. If you move the bangs aside you can see the old glue, but I sprayed them really heavily into place. Then I pulled part of the hair into a pile of curls on Maggie's head and pulled the rest into a ponytail. 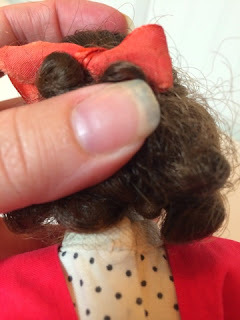 I pinned the curls into a chignon at the nape of Maggie's neck. Finally, I made a crown of vintage flowers and pinned it into place. Maggie's a beautiful ballerina! Her tight new stringing lets her hold many poses. 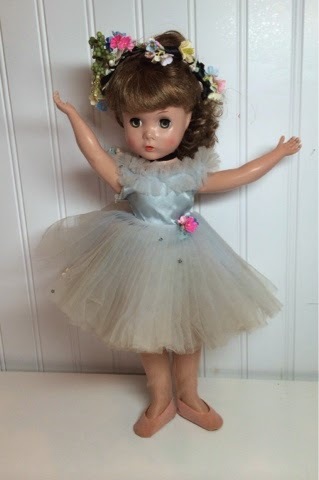 She's a wonderful doll for play or display. 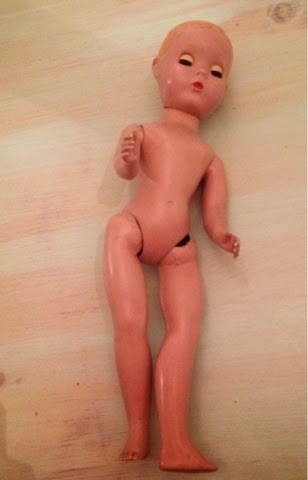 Her costume is a little fragile, so I would give this to a girl about 8 or older if you wanted her to be a play doll. In the end I was glad I hadn't used the platinum mohair wig on Maggie, because I used it on a Honey Cinderella whose wig had been cut. 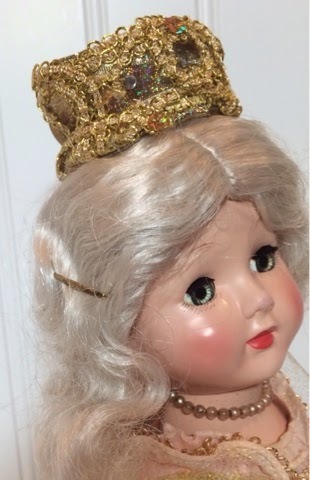 Her original wig was reddish blond, but the platinum wig is the correct style and looks very fairytale-ish. I have Honey all restored but her dress is in a shambles and I'm trying to figure out how to make her a pair of "glass" slippers. I'm hoping I'll be finished with that soon. I'm not feeling very well today, though. My husband worked from home the past two days because he was unwell and now I woke up feeling crummy. I've just been lying around in pajamas all day and haven't really accomplished anything other than writing my blog. Well, actually I'm wearing a cami with a built-in bra, so that counts as "lounge wear" and not pajamas, right? I've done something to my Achilles tendon as well, with all my 10 miles walking a day aspirations. My hope is, if I take it easy today I'll be back to myself tomorrow. Keep watching for Honey, hopefully coming soon! Shop Atelier Mandaline on Etsy! Shop Atelier Mandaline on eBay! I majored in art and writing. After years working in publishing I became a stay-at-home mother and freelance artist and writer. As our family grew to include three children, two of whom were adopted with special needs, I have less and less time for art. I started this blog to try and keep myself working on various projects. Mandaline is the nickname given me by my grandfather when I was a child. New! Pay for Goods or Services Here! Please note, any recipe posted on this blog, using Young Living products or any other, is not intended to diagnose or treat any disease, substitute for medical care, and these statements have not been FDA evaluated. Use of Young Living and other natural products is intended to strengthen the body so it can naturally defend itself. All photos and content herein are the property of Amanda Baer Boggs and may not be reproduced. Watermark theme. Powered by Blogger.